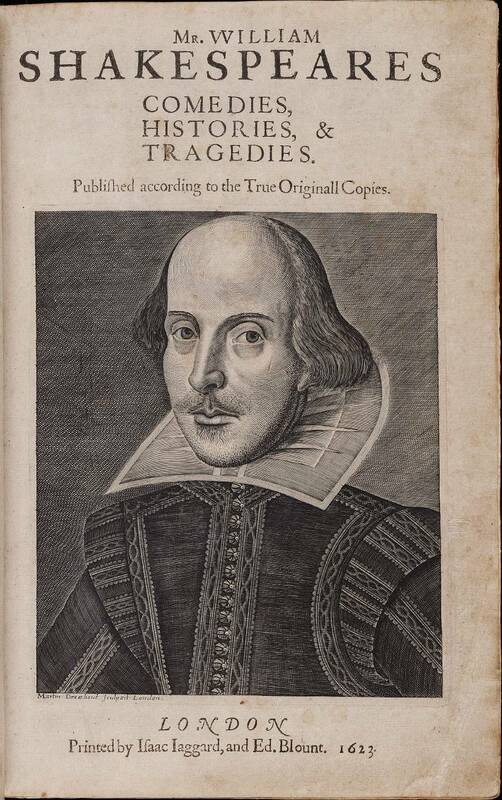 Title page of the First Folio with copper engraving of Shakespeare by Martin Droeshout. Image courtesy of the Elizabethan Club and the Beinecke Rare Book & Manuscript Library, Yale University. Who, as he was a happie imitator of Nature, was a most gentle expresser of it. His mind and hand went together: And what he thought, he uttered with that easinesse, that wee have scarse received from him a blot in his papers. Reade him, therefore; and againe, and againe : And if then you doe not like him, surely you are in some manifest danger, not to understand him. I am thinking lots about the First Folio lately, as I recently read The Millionaire and the Bard by Andrea Mays. It’s about Henry Folger’s obsessive collecting of First Folios (82! count ’em!) and other Shakespeareana and the building of the Folger Shakespeare Library in Washington… I blogged about my close encounter with a First Folio there a few years ago. I was glad to read more about Folger and his hobby. It’s quite a story… American chutzpah and wealth, eccentricity and obsession, culture clashes, and ultimately foresight and philanthropy. I’ll write about it soon. But it all goes back to Heminge and Condell, because without them, there would be no First Folio, and nothing to fill the Folger’s vast basement vaults.